All white gold jewellery is usually surface-treated with rhodium. Rhodium is a metal that belongs to the platinum group. The surface treatment is called rhodium plating and it is done in a similar way as silver plating or galvanizing. The thickness of the rhodium plated surface layer is measured in microns i.e. in millionths of a meter. The surface colour of rhodium-plated white gold is pure white, unlike white gold itself. The natural colour of white gold is slightly darker and greyer, and in poorer grades yellowish or brownish. Since it is a surface treatment process, the plating will eventually wear off partly or completely at least when rings are concerned, and the natural colour of white gold will emerge. How quickly and to what extent the rhodium plating wears off depends largely on the shape of the ring shank and on the ring’s usage. Thus, it is not possible to give a simplified statement on the time it will take for the rhodium plating on a white gold ring to wear off. The wider the ring’s even surfaces or surfaces elevated high from the finger are, and the more it is used in “hard chores”, i.e. at the gym, in gardening and cleaning tasks etc., the more the ring’s rhodium plating is subjected to wear and tear. White gold does not get abrasion marks any more easily than yellow gold. The abrasion marks on a white gold item are just more visible, as they partially wear out the bright, light rhodium surface, which results in a colour difference between the undamaged and the damaged surface. Wear and tear on a yellow gold item only results in scratching, the surface colour of the ring does not alter. A white gold ring can also be ordered without rhodium plating. In that case, the colour of the ring will not alter although in time it will get worn and scratched. A white gold ring will remain beautiful and intact year after year if you have your goldsmith re-rhodium plate it every now and then. The cost of re-rhodium plating is, depending on the model, usually about 30 – 50 euros. 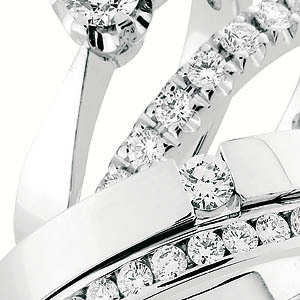 At the same time, the ring can be polished and the setting of the diamonds can be checked. It is advisable to have the setting of the diamonds checked on all diamond rings anyway at least every couple of years. A white gold item requires thus slightly more care than a yellow gold item. One can look at it as having the white gold ring regularly serviced in the same way as one would e.g. a car. After the maintenance, the ring is as good as new, and also the setting of the diamond is secured. It is also good to bear in mind that all jewellery – also those made of other materials than white gold – should be cleaned regularly and frequently. Depending on usage, even a weekly cleaning might be necessary, but normally once or twice a month is sufficient. You can find more information about cleaning jewellery in the section Jewellery care. There are many different white gold alloys on the market. Sandberg diamond jewellery contains only the finest palladium-white gold alloys, which are nickel-free and have the best possible properties (e.g. colour).